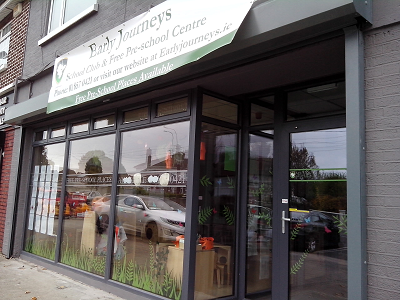 During August 2014 CK Architecture was approached by a childcare facility for the change of use and refurbishment of a retail unit to provide childcare services. The building is a 2-storey end of terrace property which was subject to legal procedure. A refurbishment was started by the previous owners, but was never completed. 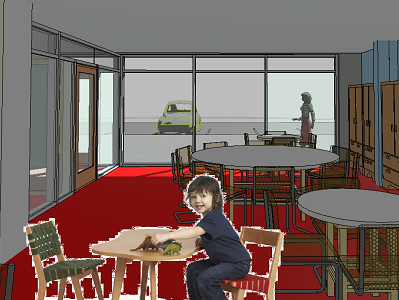 Our clients were purchasing the property subject to planning permission being granted for a childcare facility. The brief consisted in providing a functional and agreable space for older children after school services at first floor, with a computer room and sanitary facilities, as well as a staff room to be provided at either floor. The client were willing to keep the ground floor for younger children along with a kitchen / snack preparation area and a quiet room. The rear courtyard was in poor condition and the clients were looking for landscaping works to provide a safe palyground. The clients were also considering converting the attic space and extending the building first floor in order to create a larger facility. The clients budget did not permit the enlargement of the first floor or the conversion of the attic space. A pull-down ladder was specified to facilitate storage at this location without a structural floor to be created. The internal layout was fully reconfigurated. 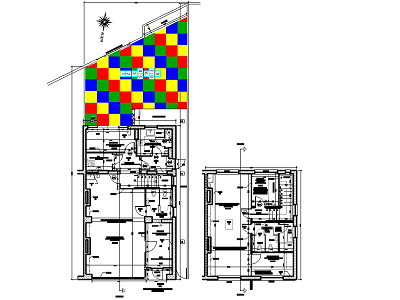 The existing stairs was removed and new stairs compliant with Part M from the Building Regulations 2010 were proposed. The front access was relocated and the front glazed facade replaced. We proposed porous and colorfull mats for the playground, with a new surface water drainage system. Altro floor finishing with colors to stimulate children senses were specified. Glazed partitions were used to provide adequate natural light, while the planner reqruied the low level glazing of the front facade to be opaque. The clients asked for white walls and ceilings to be decorated by the staff and children. The project was designed in compliance with the childcare regulations 2006. A planning application was lodged during September 2014 and granted in December. Due to uncertainties with the change of ownership, there were delays for the preparation of the tender and applications for a fire safety certificate and a disability access certificate. The facility was designed in compliance with the Childcare (Pre-school services) Regulations 2006. CK Architecture designed the project for compliance with building regulations. We organised the tender and drafted all contractual documents. The fire officer imposed a magnetic system linked to the fire alarm to allow the lobby doors to be preserved opened and safe in the event of a fire within the facility. CK Architecture applied for the fire safety certificate and the disability access certificate which were granted in January 2016. We were not involved with the construction process, but our design was used for all construction works. The building was fully re-wired and equipped with a new heating and plumbing system. The construction works started during February 2016 and were completed in August. The contractor works were supervised by a civil engineer. The facility opened in September 2016.